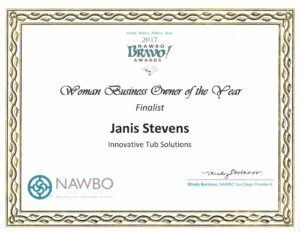 Last year, Janis Stevens, President and CEO of Innovative Tub Solutions, was honored as the Woman Business Owner of the Year. Janis was chosen from a group of 5 highly accomplished, outstanding San Diego woman business owners who achieved success while overcoming adversity. In March 2018, Janis Stevens was selected by the San Diego chapter as a finalist for the coveted NAWBO-CA Business Woman of the Year Award for 2018, to be announced at the Propel Your Business Conference in Sacramento, CA, April 22-24, 2018. While Janis was chosen for this honor by her San Diego chapter peers, her selection as a finalist was endorsed by her region and other chapters throughout the State of California, as well as the NAWBO-CA Corporate Partners and supporters. 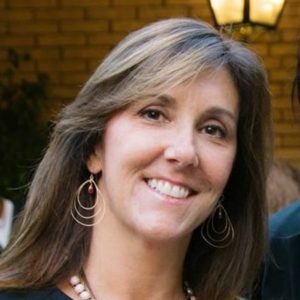 NAWBO-CA salutes Janis for the incredible accomplishment of being named a finalist. NAWBO, the National Association of Woman Owned Businesses, is a non-profit organization of more than 5,000 members that represents women business owners across all industries. NAWBO San Diego is one of about 60 chapters across the U.S. Since 1975, NAWBO has helped women evolve their businesses by sharing resources and providing a single voice to shape economic and public policy.